Originally built in 1939, the Hambly House is one of only a handful of Art Moderne houses to be found in Ontario. The original building, built for Jack Hambly, is a striking example of streamlined late Art Deco in Hamilton; the flat-roofed building sports an archetypal curved corner with speed-striped stucco walls, nautical-inspired detailing including a porthole window, and a prominent front door surround. The house was purchased in dire condition in 2013 by new owners who wanted not only to rehabilitate the house but also to reimagine it. They recognized the opportunity to connect with their new neighbours through the process and product of the design by holding regular, open dialogue with their community from the project’s conception. They were also able to maintain a closely collaborative approach with the architects, construction managers, builders and consultants. The design team’s unifying goal was to celebrate the bold, modern spirit of the existing house – a designated heritage building – while expanding square footage with an addition and renovation of its own time that forms both an aesthetic and functional response to what came before. The addition needed to be equally bold and use modern technology, but to do so quietly, with light, openness and transparency as a respectful gesture to its radical past. Major moves of the comprehensive restoration and reinterpretation include the addition of a back dining room and loggia serving to open and expand the kitchen into the backyard, and a second storey living space wrapped in floor-to-ceiling glass, with a curved corner that mirrors the home’s original solid curve below. Celebrating the streamlined spirit of its Art Moderne design, the addition is governed by the same horizontal logic that organizes the existing façade, with the restrained machine age contours allowed free play between lightness and mass. The original single-storey plan was significantly de-compartmentalized, allowing light, air and space to flow freely – a luxury afforded by a thorough revamping of the home’s underground waterproofing, along with a freshly insulated, airtight envelope with new true-to-original windows and freeze-thaw-proof stucco. Utmost care was taken to preserve details when possible, including the original ceiling plasterwork and marble fireplace in the main floor living room. Two of the three original bedrooms remain – the third being claimed by a mudroom off the backyard and a small living room nook. Clean, minimalist custom millwork unifies the completely refinished interior. A bright turquoise stove and fridge were brought from the owners’ former home and were the starting point for the kitchen design. The rear-cantilevered volume of the upper storey adds a generous master bedroom with ensuite at the back, and a light-filled, expansive living area opening to a rooftop patio at the front. 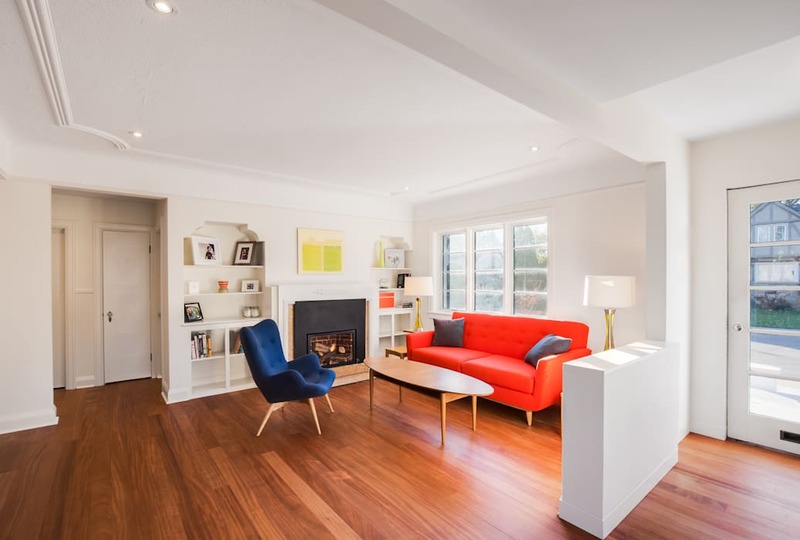 Highly visible to the street corner, this living room is a symbolic connection to the community as it announces a decisive transparency, a way of life that welcomes neighbours with open arms. Symbolism aside, the home’s new residents are practicing what they preach; they will be opening their home to the public as they celebrate the completion of the renovation.